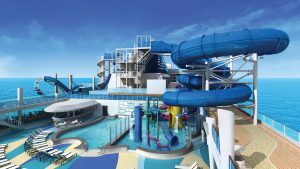 Norwegian Cruise Line has revealed features and amenities for the 4,000-guest Norwegian Bliss, the line’s 16th ship, which will sail to Alaska and then the Caribbean starting in spring 2018. 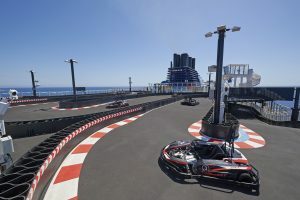 Following this feature’s overwhelming popularity aboard Norwegian Bliss’ sister ship in China, Norwegian Joy, guests will be able to put the pedal to the metal for the first time aboard a North American–based cruise ship with a two-level electric-car race track. The competitive track, the longest at sea at nearly 1,000 feet, features twists and turns with four speed settings accommodating novice, intermediate, and advanced drivers, reaching up to 30 miles per hour with a special “turbo boost” available on each lap. The electric cars run silent, but guests will have the full racing experience as the sounds of a racecar engine are piped in through speakers located in the car’s headrest. Guests can also test their agility at an open-air laser tag course. Themed as an abandoned space station, the course comes to life both day and night as guests go into stealth-mode and compete against family and friends with state-of-the art laser guns. The ship’s expansive pool and sundeck features two spacious pools and six hot tubs that scale the side of the ship. An Aqua Park includes two multistory waterslides: the high-speed Ocean Loops free-fall slide includes two exhilarating loops, one that extends out over the side of the ship and a second see-through loop that stretches down to the deck below; and the tandem Aqua Racer slide allows guests to race side-by-side on inner tubes for more than 360 feet, with a translucent section that provides stunning ocean views. Junior cruisers will have a blast at the Kids’ Aqua Park, which features splash pads, water cannons, tipping buckets, and slides, as well as at Splash Academy, which offers age-appropriate supervised activities for children aged 3 to 12 with fun and educational programming including games with the conservation-minded Officer Snook, a circus celebration, jungle-themed nights, and more. Teens aged 13 through 17 will enjoy their own space, Entourage, which features plush lounge furniture, gaming stations, foosball, air hockey, and a dance floor. Even tiny cruisers, ages six months to just under 3 years old, will have an dedicated space to enjoy at the fleet’s largest Guppies playroom, where Early Years Coordinators will host sensory-play activities for parents and babies including messy play, exploration, music, and movement. The ship’s youth programs will also cater to children with special needs in their designated age appropriate space. 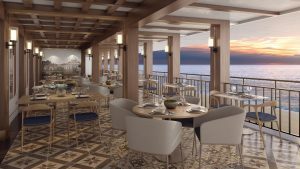 Dining and bar options include signature Norwegian favorites as well as exclusive new concepts that will debut aboard the ship. Modern décor and premium ingredients will meet southern flavors at the all-new Texas Smokehouse, Q, where guests will enjoy live contemporary pop country music each night as they indulge in authentic Texas barbeque in a sleek urban setting. Los Lobos, an outpost of the brand’s new restaurant serving elevated Mexican cuisine that made its debut in 2016 aboard Norwegian Dawn, will offer an upscale, modern take on traditional favorites like fresh guacamole prepared tableside, al pastor tacos, enchiladas de mole, handcrafted margaritas featuring private-label Patron Barrel Select, Norwegian’s own tequila blend, and more. There will also be a Cagney’s Steakhouse, Norwegian’s signature American-style steakhouse that serves choice cuts of Hartley Ranch Premium Black Angus Beef, as well as The A-List Bar, named for Norwegian president and CEO, Andy Stuart, which will serve handcrafted cocktails, wines, and premium spirits. Sweets and treats will be served day and night at the chocolate-themed dessert restaurant, Coco’s, a completely new à la carte dessert venue located in the heart of the ship, 678 Ocean Place. And in a nod to the ship’s homeport of Seattle, guests can warm up with a Caramel Macchiato or grab a Teavana Shaken Iced Green Tea Lemonade with a full-service Starbucks on board. Other signature à la carte restaurants include French cuisine at Le Bistro; the tastes of Tuscany at La Cucina; the fresh seafood at Ocean Blue; global fusion cuisine featuring sushi, dumplings, handhelds, and more at Food Republic; Cheeseburgers in Paradise at Jimmy Buffett’s Margaritaville at Sea; and handmade cupcakes and macarons at The Bake Shop. Teppanyaki, the brand’s family-favorite Japanese hibachi steakhouse will also be on board at cover-charge pricing. In a new complimentary dining concept, The Local will offer guests pub fare in a relaxed neighborhood atmosphere 24 hours a day. Norwegian’s original beverage concepts will round out the ship’s culinary offerings. The District Brew House will serve 24 beers on tap and more than 50 bottled beers, along with bites from the adjacent Food Republic. Local favorites on tap at The District will include craft beers from Red Hook Brewery and Elysian Brewery in Seattle as well as Wynwood Brewery and M.I.A. Beer Company in Miami. The Cellars, A Michael Mondavi Family Wine Bar will offer a curated wine list featuring 35 grape varietals including top selections from Washington-area vineyards, Tuscany, and Michael Mondavi’s own Napa Valley Estate, as well as light bites from La Cucina. Wine will come to life at The Cellars with interactive educational seminars and tastings daily. Paying homage to her homeport cities, Norwegian Bliss’ beverage program will also feature a selection of local craft cocktails developed by Seattle-based celebrity mixologist and chef Kathy Casey as well as Miami-based Gabe Orta, one of the master curator’s behind the city’s ultra-popular Bar Lab concepts. The Mandara Spa will feature 24 treatment rooms, a full-service salon and barber shop, fitness center, and thermal suite. The Fitness Center will offer the latest TechnoGym cardiovascular and strength training equipment, as well as personal training and group fitness classes including TRX, Norwegian Fight Club, RYDE Cycle, and more. In addition to the spa, adults will be able to unwind in two private lounge spaces at Vibe Beach Club and Spice H2O. Norwegian Bliss’ entertainment offerings include the Tony Award winner for Best Musical, Jersey Boys, and two observation lounges, including the exclusive Horizon Lounge for guests of The Haven. Continuing its tradition of featuring original artwork on its ship’s hulls, Norwegian Cruise Line commissioned Wyland, one of the world’s premier marine life artists, to design the hull art for Norwegian Bliss. During her inaugural summer season, Norwegian Bliss will sail weekly 7-day Alaska cruises from Seattle, featuring calls in Ketchikan, Juneau, Skagway, and Victoria, along with scenic glacier cruising. She’ll then sail her inaugural winter season beginning in November 2018, sailing 7-day Eastern Caribbean cruises from PortMiami, featuring calls in St. Thomas, Tortola, and Nassau.